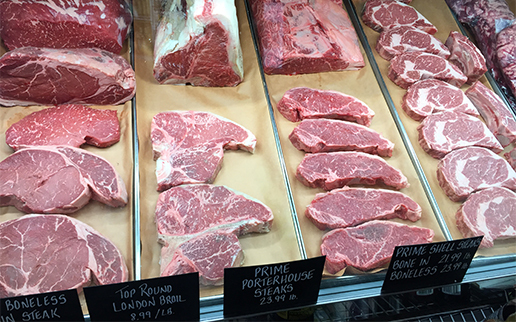 The Market at Gus’s takes great pride in only serving Prime and Certified Angus Beef to our customers. Featuring every meat cut from filets to rib eyes, porterhouse, NY Strip, Sirloin, Flank, and Skirt Steaks we are your beef experts. The Market at Gus’s also carries organic and free range poultry, pork, and Italian Sausages. We are a premium butcher shop carrying domestic lamb, this lamb is milk-fed Veal and has never eaten a blade of grass since its birth. We can cut this veal into Rib and Loin veal chops, top round veal cutlets, Veal Filet and of course Veal Osso Buco! All of these meats are carved by professionally-trained butchers on-site every day. If you have any special requests, don’t hesitate to ask them! The Market at Gus’s has it all. Come see for yourself, there are just too many items to list.